Budapest delivers all that you’d expect from Europe’s best big cities: beautiful monuments, busy museums, bustling nightlife, break-worthy bathhouses. Wait a minute, back up: bathhouses?! That’s right – Budapest is a straight-up spa city, bubbling over with more than a hundred natural underground hot springs that have been luring visitors since Roman times. With some 15 perfectly affordable bathhouses set right in the city, you’ll have plenty of opportunity to indulge in some budget-friendly R&R, where you can channel your inner “Buda” without those “pesty” bills piling up (and also wash away the cringe factor at having had to read that wordplay). 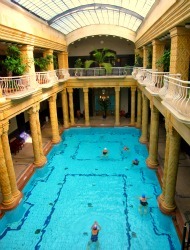 Just back from a rejuvenating rest in Budapest, here are two of my top bathhouse picks. While they aren’t necessarily the cheapest in town, they definitely bring out the best of Budapest’s bathing culture. The city’s oldest and largest bathhouse (billed as the biggest public bath in Europe), the bright yellow Neo-Baroque building of the Széchenyi Baths complex is set in City Park, presenting picturesque alfresco pools and interior baths capped by soaring cupolas. Some 18 coed pools vary in size and temperature; numerous saunas and steam baths, aqua-aerobics classes, and a fitness room are also included in the entry rates. Salon and massage services can be booked at an additional cost. Tickets: Daily weekend tickets granting full-day access start at $19 with private cabin usage, or $16 with lockers; weekday visits are cheaper still ($17.50 for private cabins; $15.50 with lockers). Two-hour morning (between 6am and 8am) or evening (between 5pm and 6pm, or between 7pm and 10pm) visits start from as little as $13. Top Treatment: Book a 30-minute aroma massage for just $18.50, combining Swedish technique with aromatic essential oils. This Art Nouveau-style architectural stunner, set in same building as the Hotel Gellért, features fine mosaics, stained-glassed windows, and elegant sculptures. Three of the 13 thermal pools at Géllert Baths are designated for women, another three for men, and seven, including the outdoor options, are coed (though, on Saturdays, all pools are open to both genders). Saunas, steam baths, massage treatments, and salon services round out the offerings. Tickets: Full-day passes on weekends are $21 with private cabins, or $20 with lockers; rates drop by a few bucks for weekday visits. Or, book an afternoon-only visit (after 5pm) for discounted rates starting from $14. Note, if you are guest of the Hotel Gellért, you’ll get one free entry to the baths, and a 50-percent discount on additional visits. Top Treatment: Try the 30-minute “spa water massage,” incorporating hydrotherapy elements, for just $19. Pick up a Budapest Card, which gets you unlimited use of the city's public transit system and discounts on attractions: You’ll save an extra 10 percent on admission to Széchenyi or Gellért (24-hour card costs $18). Bring along your own towel, flip-flops, swimsuit, swim cap, and snacks/bottled water, and avoid getting stuck footing the bill for them at the bathhouse. Hit up a “sparty.” Consider combining your nightlife outing and spa-going into one trip with the popular Szecska Bath Party, which includes bathhouse admission and musical entertainment, all infused by a youthful vibe (Saturdays in summer, admission from $18). Incurable travel addict, longtime travel scribe, and mindful money-saver Elissa Richard is currently indulging her insatiable wanderlust on an epic 14-month journey around the globe – intent on making it every step of the way without busting her modest budget. Follow her along the way as she reports back with budget-savvy travel tips from the mountains of Transylvania to the wilds of Tasmania, and from the little-trodden temples of Burma to the bustling bars and clubs of Buenos Aires. A vagabond in search of value, just for ShermansTravel.